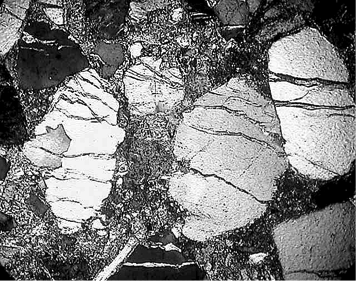 Abstract.- Spallation, a well-known process in fracture mechanics, plays a major role in meteorite impact events and is evident on all scales from megascopic spall plates and with larger structural features, over mesoscopic dynamic deformations in particular of conglomeratic target deposits, down to microscopic shock spallation in mineral grains. Here I report on experimental spallation, on various geological implications of impact spallation and on mineralogical spallation evidence, with a special focus on the Spanish Azuara and Rubielos de la Cérida impact structures and the Ries impact crater in Germany. The process of spallation in solids (not to be confused with nuclear spallation) is well understood in fracture mechanics. Spallation takes place when a compressive pulse impinges on a free surface or boundary of material with reduced impedance (= the product of density and sound velocity) where it is reflected as a rarefaction pulse. 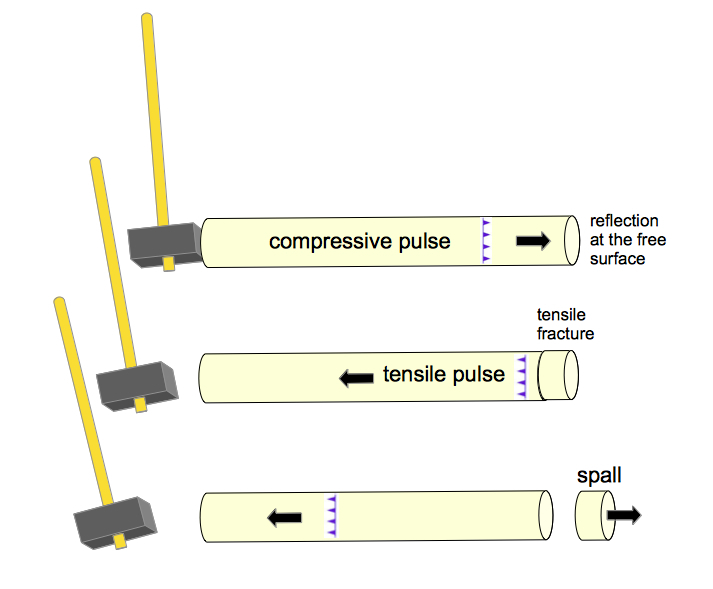 The reflected tensile stress may exceed the tensile strength of the material leading to tensile fractures and to detachment of a spall or series of spalls (Fig. 1). Fig. 1. Sketch of spallation in solids by dynamic deformation. Since the tensile strength of a matter is in general much lower than the compressive strength, spallation frequently causes the main mechanical damage and, hence, is of some practical importance. In the early years of nuclear plant construction, e.g., when catastrophic damage in an air crash was for the first time discussed, model calculations from fracture mechanics showed that tensile stresses from spallation were much more dangerous than the immediate impact. In a recent experimental technique Laser spallation uses a high energy pulsed laser to detach thin films from the substrate by the reflected tensile wave. More generally, the term spallation is also used, e.g., in quarry blasting and drilling of very hard rocks in boreholes (thermal spallation drilling) where spall detachment is induced by various superposition of internal compressive and tensile stresses, which is not of further interest here. Fig. 2. Spallation experiment, shot 3, on a glass cylinder. Sequence of freeze images from a video taken with a high-speed camera, milliseconds (ms) after impact. Note the heavy damage in view of the tiny projectile of only 0.3 g mass. – Click on the image for a full-size pdf. Click the full video! Fig. 3. Spallation experiment, shot 4, on a glass cylinder. Sequence of freeze images from a video (to be clicked here) taken with a high-speed camera, milliseconds (ms) after impact. Note the heavy spallation damage by the tiny 0.3 g projectile, but also the broad segment in between that remained completely untouched. The light flash regularly emitted in the very first moment from the point of impact (also see Fig. 2) has remained unsettled. – Click on the image for a full-size pdf. 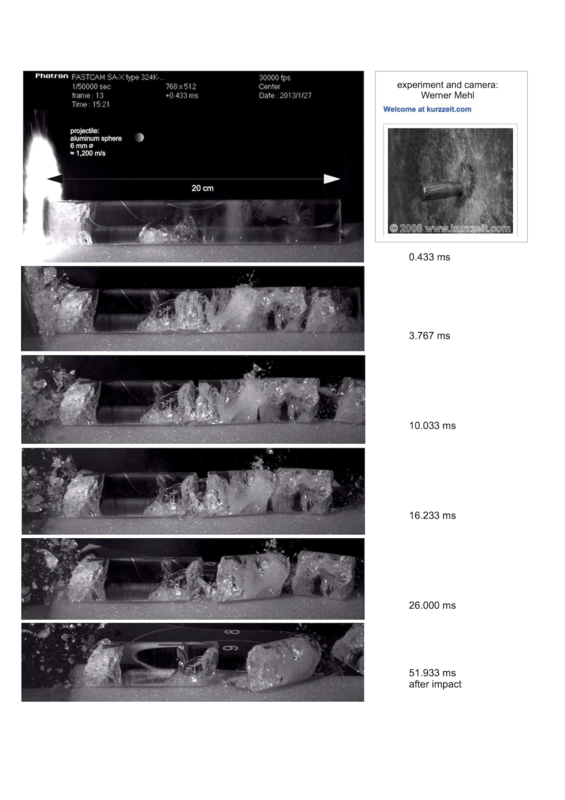 The spallation experiments have been performed in cooperation with Werner Mehl who is a top expert of professional short-term measuring technique, high-speed photography and triggering systems. Different from the subparallel spallation fractures in the glass cylindrical bars resulting from the reflection at the plane end, spallation in more complex bodies and – with regard to spallation in geologic objects to be discussed below – may feature quite specific tensile fractures. For geometrical reasons the reflected tensile wave front roughly mirrors the geometry of the free surface which is especially striking in spherically shaped objects (Fig. 4) and will further on become evident in images of spallation fractures in rocks and minerals. Fig. 4. 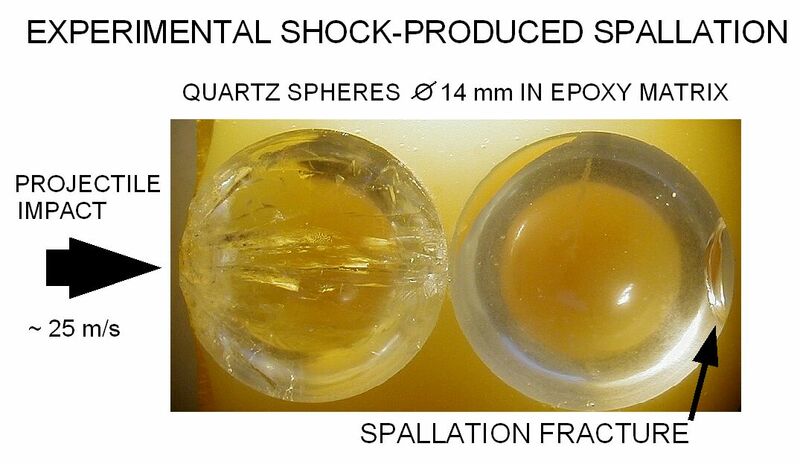 Open spallation fracture in a quartzite cobble a s a mirror of the shock-reflecting surface (left), and an experimentally produced lens-shaped spall in a quartz sphere. On a megascale, spallation in impact cratering was, obviously for the first time, introduced by Melosh (1989) with the concept of spall plates. 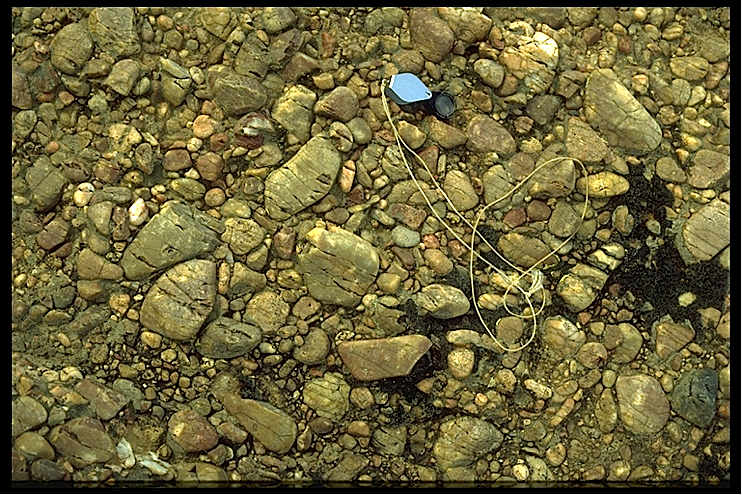 Spall plates form in the early phase of impact excavation in the superficial interference zone where the expanding compressive shock front superimposes with the tensile rarefaction waves starting from reflection at the free surface of the impacted target. From this, large rock bodies, the spall plates, are expelled with enormous velocities at the same time carrying only slight shock intensities. For a long time spallation and spall plates remained a more theoretical idea and concept, in particular among geologists because of the not so simple mathematical background, but initiated also a few experimental approaches (e.g., Polanskey 1989, Polanskey & Ahrens 1990). 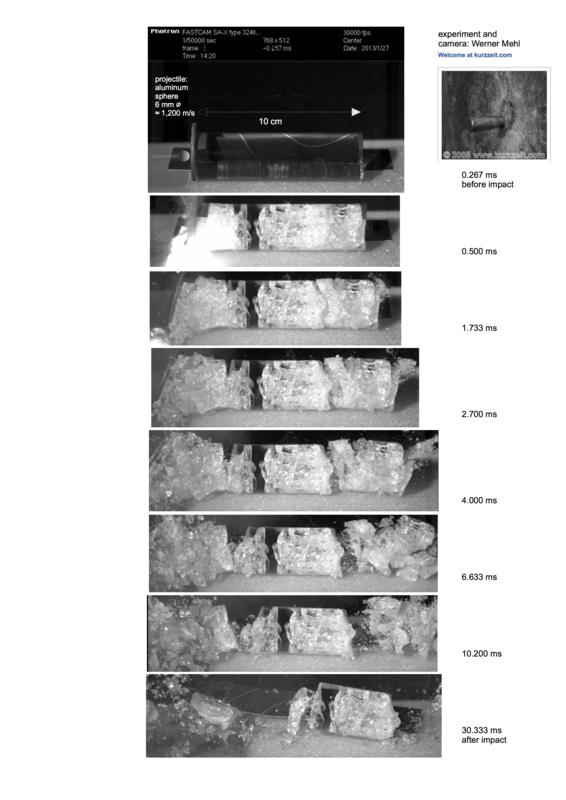 Only in recent years, but rarely, spall plates have entered impact literature being considered in connection with impact excavation and impact ejecta (e.g., Buchner et al. 2007, Osinski et al. 2013), although much earlier the spall plate theory could have explained many a geologic observation. In the famous Ries impact structure (Nördlinger Ries crater), e.g., the Bunte breccia sedimentary ejecta from the upper part of the mixed target are standing out due to their very low shock metamorphism. This holds true also for shatter cone development. Even up to now not any shatter cones that are formed at shock pressure exceeding roughly 2 GPa have been observed to occur in the sedimentary rocks, although the thick fine-grained Malmian limestones from the uppermost target would have made an excellent material for shatter cones. Together with the in part enormous range of excavated big megablocks (see HERE) the spall plate concept seems well applicable to the Ries crater. As for the big ejected megablocks displaced over 15 km or more from the Ries crater a nice counterpart has been found to exist in connection with the ≈ 40 km-diameter Mid-Tertiary Azuara impact structure in Spain where the spall plate concept can be applied as well (Claudin & Ernstson 2012). Interestingly, the formation and expulsion of spall plates can nicely be observed also in experimental hypervelocity impact cratering. A respective report can be found by clicking HERE, and a foretaste is seen on clicking on the image (Fig. 5). Fig. 5. Hypervelocity impact crater development in an experiment. Clicking on the image starts a play back of the video taken with a high-speed camera. Shot and camera: Werner Mehl. The effect of spall plate highest-velocity ejection to be observed in an experiment as a matter of fact was in particular crucial to understand a geologic observation of enigmatic “erratic” large blocks in the field of the Chiemgau impact meteorite crater strewn field (Ernstson et al. 2010) – more HERE and by clicking on the label. Learn more about spall plates and distal impact ejecta. Click on the label and copy the impact experiment video as a file to a folder on your disk. On a somewhat smaller scale impact spallation must be considered a significant geologic process in impact cratering considering rock deformation and structural features in and around impact structures. Originally, compressive deformation by the propagating shock waves were considered the main acting forces, but the idea that spallation and related strong tension by rarefaction waves are the dominant component of damage and deformation is little by little gaining acceptance in impact research. This is insofar important as geologists are often rather puzzled being confronted with complex tensile features not listed in their textbooks. As early as some 20 years ago the authors of this website have repeatedly pointed to such a tectonic style in the Azuara impact structure enigmatic for “normal” geologists frequently, and more than ever, raising opposition against impact as such. Fig. 6. On clicking on the image more can be read about rarefaction and impact structural features. Spallation works best if the compressive (shock) pulse impinges on a rock boundary of strong impedance change (see chapter 1) or in particular on a free surface. Hence, spallation is a prominent feature to be observed in shocked conglomerates when competent cobbles are embedded in a soft matrix. Exemplarily this process is exposed and can nicely be observed in the widespread Buntsandstein quartzitic conglomerates that were in part strongly shocked in the big Azuara/Rubielos de la Cérida impact event in Spain. Fig. 7. On clicking on the image with the shocked cobble and open spallation fractures a lengthy report on the many aspects of the deformations of the Spanish shocked conglomerates with a special focus on spallation can be read. Geologists have never understood these deformations, and since decades and without a closer look at them they have always interpreted the clear spallation features as having originated from tectonic load and pressure dissolution. Even impact researchers not exactly unknown like Bevan M. French and Christian Koeberl when mentioning the cobble deformations of the Spanish Buntsandstein conglomerates (French and Koeberl 2010) in connection with the publication of Ernstson et al. (2001) in the GEOLOGY journal show that they have obviously not understood spallation and the complex physical process related with shock propagation in spherically shaped cobbles. More evidence of impact spallation in the Spanish impact regions is found with cobbles and boulders from the prominent impact ejecta (Pelarda Fm.) (Fig. 8). Fig. 8. 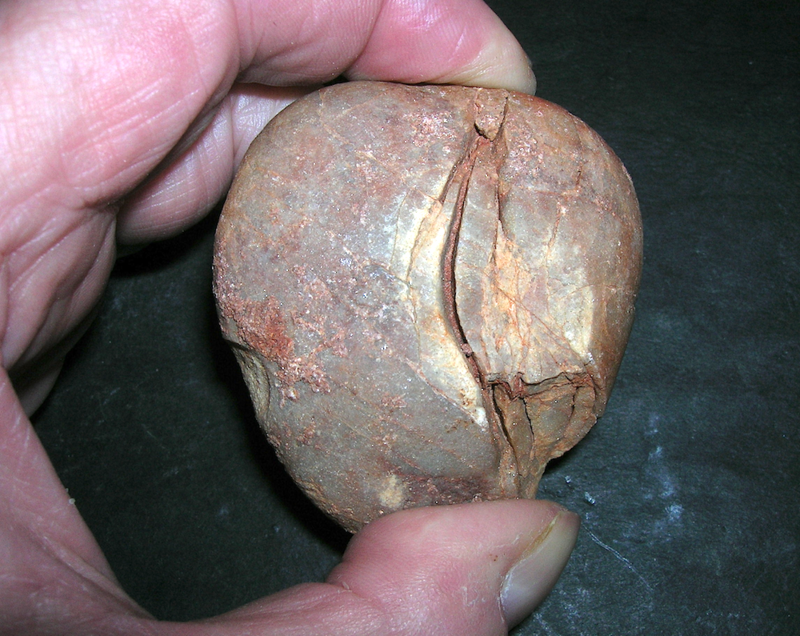 A prominent spallation fracture plane the concave surface of which is mirroring the original boulder convex shape (broken line). On clicking on the image more can be read about spallation in the Spanish impact ejecta. Also in the Ries impact crater clear spallation features are abundant but have never been recognized by geologists as such. For a more detailed discussion in a bit longer paper click on the image in Fig. 9 showing spallation fractures in Ries and Azuara crater shocked cobbles and in the famous Ries shocked belemnites. Fig. 9. To the left: very similar spallation fractures in cobbles from the Ries and Azuara impact structures. To the right: The Ries belemnites have always been considered to have been deformed by shock without however specifying the mode of deformation. Spallation to have produced the abundant open, tensile fractures is a reasonable explanation. Click on the image to read the article. Moreover, impressive spallation fractures in shocked cobbles have been described and published for the Holocene Chiemgau impact event in southeastern Germany (Ernstson et al. 2010), and a special article has been addressed to their occurrence and formation: Click the image in Fig. 10 to read and see! Fig. 10. Prominent open spallation (tensile) fracture in a limestone cobble from the Chiemgau impact region.The process is nicely documented by the observation that the running fractures have come to standstill midway through the cobble. In case they had continued running, the cobble would have been fractionized to pieces, and nothing of note would have remained. For a better understanding we add that fractures always begin at a definite point within the material propagating from there with a certain fracture velocity which may change during propagation and may even become zero. Then the fracture stops unless it is again fed with energy and continues running. In the Chiemgau impact region spallation of Quaternary cobbles is often accompanied by distinct open (tensile) fractures that are completely filled with glass quenched from impact melt (Fig. 11). Fig. 11. A shocked cobble from the Chiemgau impact region with prominent open spallation fractures filled with glass. The perfect fitting of the zig-zag fracture planes proves the tensile character of deformation without any shearing. 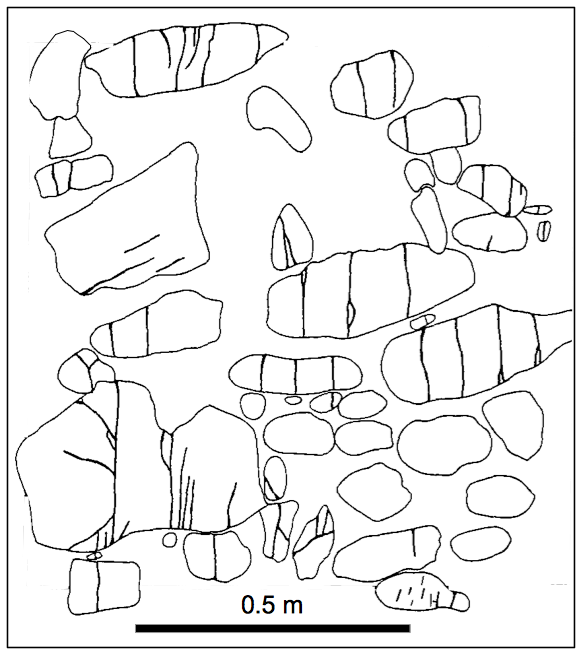 Comparable to the Chiemgau finds, strongly shocked quartzite cobbles exhibiting glass-filled tensile fractures as the obvious result of spallation (Fig. 12) have been described only recently also for the newly established Nalbach impact event in the Saarland region of western Germany (Müller 2011, Müller 2012, Berger 2014). Fig. 12. 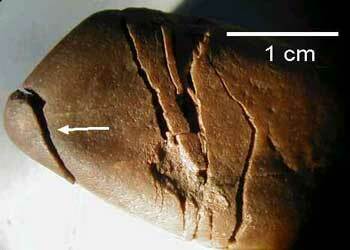 Nalbach impact: glass-filled tensile fractures in quartzitic cobbles; sawed surfaces. 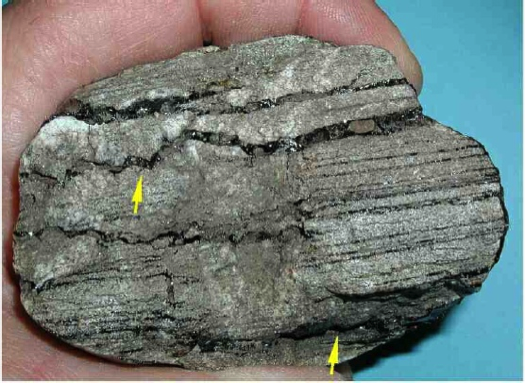 Note the fissures often narrowing from the surface which document the direction of fracture propagation and the injection of the melt or the rock vapor. 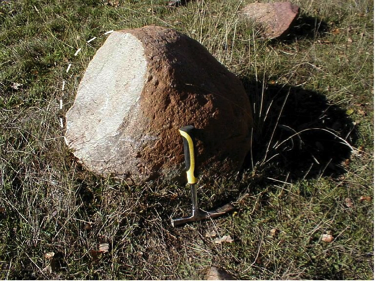 Geologists are commonly accustomed to gradual processes and very slow deformation of rocks which among other things is the reason behind their frequently articulated reluctance to meteorite impact phenomena manifoldly addressed here on our website. This in particular may explain that they tend to interpret unusual deformation features they have observed in nature by intricate models of slow tectonic movements and/or complex stress – strain relations. Exemplarily, much opposition has been roused to the impressive spallation features exhibited by the Buntsandstein quartzite conglomerates affected by the impact shock of the Spanish Azuara and Rubielos de la Cérida impact structures. Not only geologists having worked in the region of the large Spanish impact event like Spanish regional geologist or the geologists from Amsterdam around Jan Smit, who evidently overlooked the exceptional situation or did not understand the peculiar deformations, but also remote geologists like Shapman, Evans & McHone (2004) never having put their foot on the Spanish terrain prefer to discredit the dynamic mode of impact spallation (A comment on their paper of rather bad science can be clicked HERE) in favor of a tectonic explanation. And we mention (and discuss HERE) also French & Koeberl (2010) who have evidently not understood the spallation features in the Spanish shocked conglomerates. In contrast, good science is an earlier article on fractured pebbles (Eidelman & Reches 1992) that is a fine clue for discussing quasi-static and dynamic fracturing of rocks. In that article Eidelman & Reches report on two outcrops in Israel and the USA where they observed unusual fracturing of competent cobbles in a soft matrix forming thick conglomerates. The main features of this subparallel tensile fracturing can be seen in Fig. 13, and the authors were surprised to find these systematic tensile joints since such poorly cemented conglomerates tend to deform by shear and displacement. Fig. 13. Map of fractured pebbles from the Arava, Israel, outcrop. Modified from Eidelman & Reches (1992). In a theoretical model of stress – strain relationship they come to the conclusion that intrapebble tension may develop due to the amplification of the stresses inside a competent pebble within a soft matrix, even under compressive tectonic stresses. Hence, the authors suggest that these tensile fracture patterns appear to be an excellent indicator of the tectonic stress in particular because of their regional consistency. So far, so good. In 1992, Eidelman & Reches were of course not aware of the Spanish spallation features and the paper of Ernstson et al. (2001), by the way printed in the same journal GEOLOGY, otherwise they could perhaps have discussed also a dynamic formation of their tensile fractures by spallation. We will address this possibility here. With regard to their model and an interpretation of tectonic stress reflecting a single tectonic stage to deform pebbles even at depths of a few hundred meters, it appears rather peculiar that in the studied outcrops fracture-parallel displacements are practically absent (see Fig. 13). Eidelman & Reches mention less than 5% of the fractures showing a slip that is restricted to individual cobbles and is assumed to belong to a later stage. 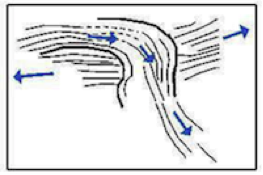 This later stage obviously means that stress distribution within the conglomerates enabled shear deformation, but it is hardly to not at all to understand why more than 95% of the already dissected cobbles escaped this shear forces completely. Moreover, we must not forget that the model of Eidelman & Reches is strongly idealized considering an elastic circular inclusion in a soft matrix under plane strain conditions (their Figure 4). This constellation may approximately function for the first tensile fracture to occur in each cobble, but for the development of the subsequent fractures opening subparallel to the first, second, third, etc. ones, these very idealized conditions are no longer fulfilled. The important observation of lacking slip added by the observation of conspicuously equidistant fractures in many cobbles (see Fig.13) creates some doubt whether the theoretically proper model of Eidelmann & Reches meets the field observations. 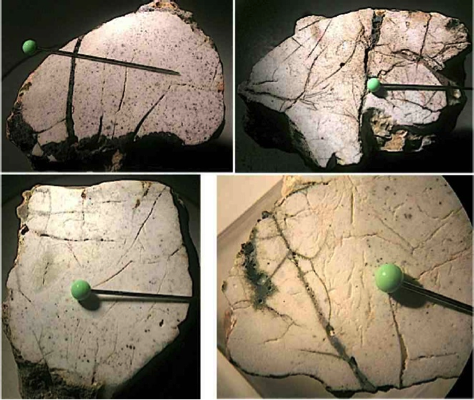 Hence we pose the question whether the tensile fracturing as described by Eidelman & Reches could be the result of rather a dynamic deformation having led to open, tensile spallation fractures, and for a first approximation we show photos (Figs. 14, 15) of a subparallel fracturing in quartzite conglomerates with open tensile fractures that has been shown to be the result of dynamic deformation in the Azuara-Rubielos de la Cérida impact event with a high degree of probability (Ernstson et al. 2001, and also HERE). The similarity to the fractured cobbles in the Eidelman & Reches outcrops (Fig. 13) without any displacements and abundant equidistant fractures is unmissable. Fig. 14. Buntsandstein basal conglomerates near Ródenas, west of the Rubielos de la Cérida impact basin. A strong sub-parallel fracturing with open tensile fractures cutting through the cobbles is observed. No slip along the joints is observed. Fig. 15. Another outcrop: Typical in situ subparallel fracturing in quartzite cobbles of the Buntsandstein basal conglomerates. The tensile character of most of the joints is obvious. No displacements due to shearing can be observed. Also note the equidistant fractures in many cobbles similar to Fig. 13. To come straight to the point, we are far from postulating meteorite impacts in Israel and California to have affected the conglomerates under discussion. However, interestingly both locations for the observations of the peculiar fractures are found at prominent active faults, in Indio Hills along the eastern side of the San Andreas fault and in the Arava Valley of the Dead Sea rift in Israel, which are characterized by significant earthquake activities (e.g. the devastating 1068 AD earthquake in the southern Arava valley (Zilbermana et al. 2005), or the Magnitude 7.3 earthquake within 30 miles of Indio Hills (http://www.homefacts.com/earthquakes/California/Riverside-County/Indio-Hills.html). Could it be that the tensile fracturing reported by Eidelmann & Reches was not produced by tectonic slow deformation but occurred dynamically by spallation induced by a heavy earthquake shock? Spallation as an earthquake damage to buildings is not uncommon. After the August 23, 2011, Mineral, Virginia earthquake the Washington Monument exhibited a number of spalls formed at the exterior surface of the pyramidion, and nice photographs can be seen in a report (WASHINGTON MONUMENT,Post-Earthquake Assessment, National Mall, Washington DC, EXECUTIVE SUMMARY) to be clicked HERE. Remarkably, the spalls as such are shown and described, but the physical process of spallation with the most effective tensile stress at the free surface is not addressed. Likewise, in earthquake engineering the term spalling (not spallation!) is frequently used but considers various mechanisms by which spalls simply break away from affected buildings or constructions. We may ask whether the peculiar equidistant tensile fractures seen in the figures 13 – 15 and also observed with the fractured Ries belemnites are an attribute to support a dynamic formation by spallation. The experimentally fractured glass rod (Fig. 3) may underpin this assumption with regard to Fig. 16 where we show a snapshot taken from this figure. A physical model may consider some interference procedure and should be investigated in more detail. Fig. 16. The 16.233 ms snapshot from Fig. 3 featuring roughly equidistant zones of preferred damage. On the whole and to summarize, dynamic deformation and spallation remain the “unknown entity” in geology, but with regard to the highlighting spallation experiments as discussed above (Figs. 2, 3) we have to be aware that even very small spallation energies are able to produce enormous damage. We don’t know whether the tensile-fracturing tectonic model of Eidelman & Reches is the correct explanation for the observations in Israel and the USA, but for replacing it by the more reasonable spallation model more field work under the aspect of an earthquake-related deformation is needed. 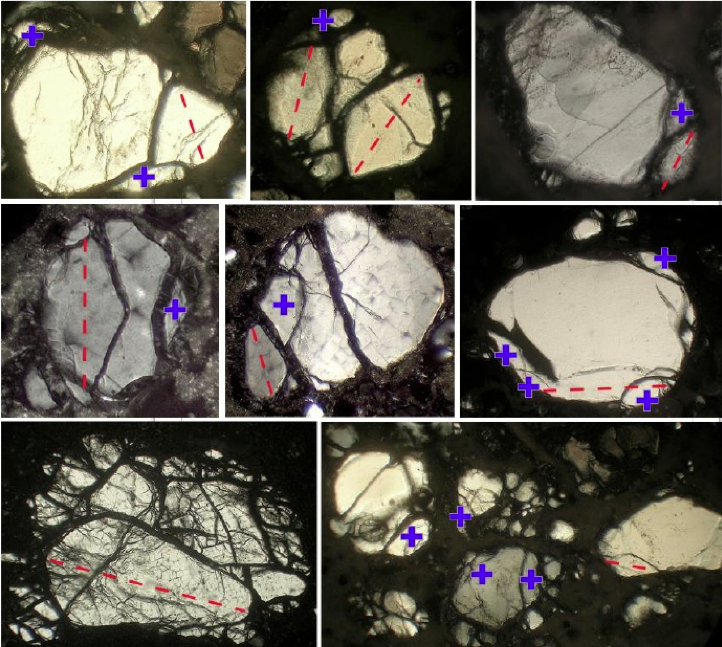 Here we focus on a few examples of shock-induced spallation features and especially refer to earlier work published here on our website.Shock spallation on a microscopic scale especially in quartz grains can regularly be observed in shocked rocks from impact structures. Interestingly and rather surprisingly, these effects have never been considered by other impact researchers working on shock metamorphism in geologic materials, although spallation in quartz grains may be considered diagnostic of strong dynamic deformation. On the other hand, in impact engineering shock deformation and spallation damage by laser shock load in various materials and especially also in quartz has been addressed in recent times (Rességuier et al., 2005, 2010) featuring interesting results that, together with the effects shown here, should add to commonly described shock effects in quartz like planar deformation features (PDFs), planar fractures (PFs), diaplectic glass, ballen and feather structures. Here we focus on a few examples of shock-induced spallation features and especially refer to earlier work published here on our website and elsewhere. Fig. 17. Shocked sandstone from the Rubielos de la Cérida impact basin (Spain) with multiple spallation (tensile) fractures in quartz grains. Click on the image to read more about shock spallation and shock effects in general. Photomicrograph, crossed polarizers. Fig. 18. Glass-filled spallation fractures in quartz grains from shocked rocks in the Chiemgau impact meteorite crater strewn field. Note the approximate mirror symmetry of fracture and grain boundary geometries. Photomicrographs, crossed polarizers. Fig.19. Quartz grains in shocked impact melt rocks from the Nalbach impact event in the Saarland region. 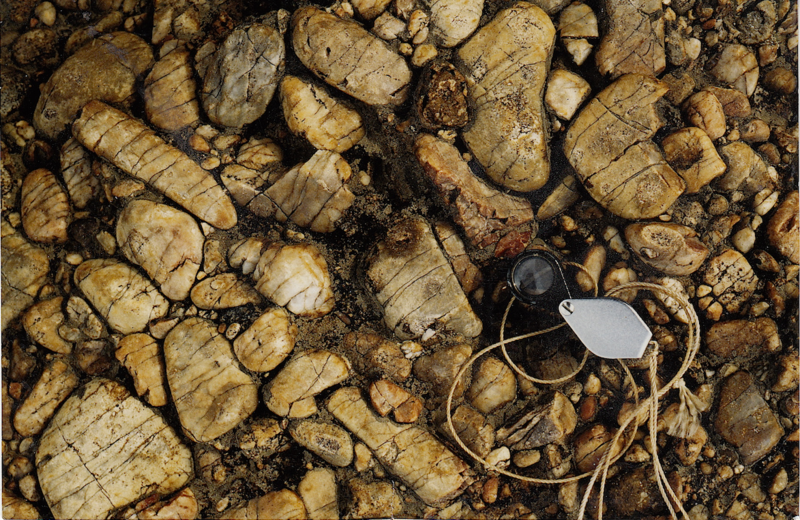 Note the glass-filled spallation (tensile) fractures identical to the Chiemgau features in Fig. 18. Blue: Some marked spalls; red: lines of symmetry within spall fragments.Photomicrographs, crossed polarizers. Image taken from the diploma thesis (Berger 2014). Planar fractures (PFs) in quartz as a shock effect – also produced by spallation? Commonly quartz is considered to have no cleavage, and in practically all mineralogical literature this statement is textbook knowledge. But this is not correct apart from very scarce hints to rare cleavage after the rhombohedron due to extreme tectonic pressure in strong regional metamorphism. However, cleavage in the form of crystallographically oriented planar fractures is a common shock effect in quartz (Fig. 20) and develops already at moderate shock intensities. Today, multiple sets of PFs in quartz are considered even diagnostic of shock and meteorite impact (French and Koeberl, 2010). Fig. 20. 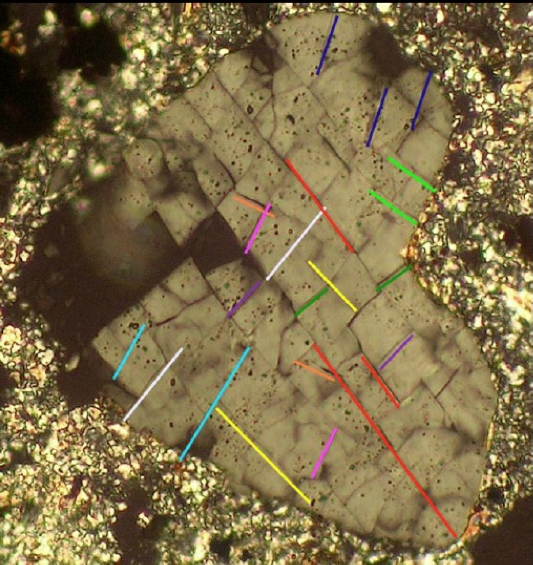 Multiple sets of planar fractures (together with a few spots of diaplectic glass) in a quartz grain from shocked rock; Nalbach (Saarland) impact event. Photomicrograph, crossed polarizers. Image taken from the diploma thesis (Berger 2014). But why this strict difference between strongly deformed quartz in tectonics revealing irregular fracturing at most and moderate shock to produce nice cleavage with more or less slightly open fractures (Fig. 20)? A reasonable explanation may be given by the difference in compressive and tensile stress of a material the latter in general being much lower than the former. Hence, cleavage in quartz may occur on tension following crystallographical planes of weakness but not on compression. And since tectonics may compress single quartz grains but is unable to pull a grain open, we need tension for cleavage and PFs, and the simple connection between impact shock and cleavage is given by spallation due to rarefaction from compressive shock reflected at the free surface of the quartz grain as tensile pulse. While this explanation makes some sense, additional conditions must obviously be fulfilled to produce either planar fractures of cleavage, or curved spallation tensile fractures like those in Figs. 18, 19, or subparallel open spallation fractures like those in Fig. 17. These conditions are unsettled so far. Berger, N. (2014): Analysis of a possible meteorite impact in the Prims river area (Nalbach, Saarland Germany). 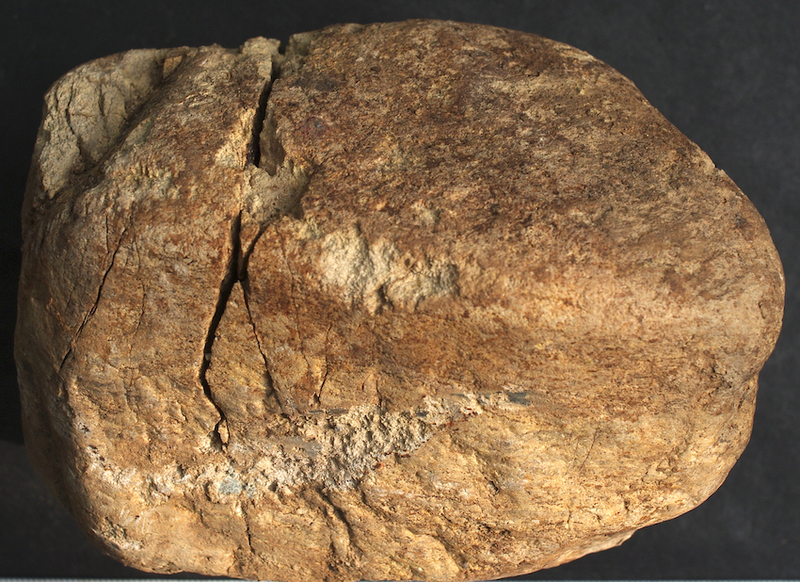 – Diploma thesis (in German): https://de.scribd.com/doc/235616934/Strong-shock-metamorphism-establishes-meteorite-impact-in-the-Saarland-West-Germany. — English Abstract and Content. Polanskey, C.A. (1989): I. 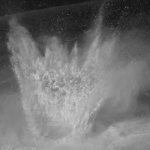 Impact spallation experiments: fracture patterns and spall velocities. II. Craters in carbonate rocks: an electron paramagnetic resonance analysis of shock damage. Dissertation (Ph.D.), California Institute of Technology. Abstract.